Pittsburgh IAP Air Reserve Station is located northwest of Pittsburg, Pennsylvania on the Pittsburgh International Airport. 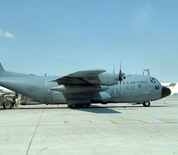 The 911th Airlift Wing of the 22nd Air Force conducts C-130 H2 Hercules tactical airlift operations from base. The Pennsylvania Air National Guard's 171st Air Refueling Wing is also located on the airport. Pittsburgh IAP ARS has been host to the Wings Over Pittsburgh Air Show and Pittsburgh Navy Week. The surrounding metropolitan area is rich in arts and culture. There are numerous museums, theaters and sporting arenas to be enjoyed by personnel stationed there. This Pittsburgh IAP ARS directory features the critical info you’ll need to navigate through the many facilities and recreational opportunities available on base.